If you live in Austin, the odds are that you have eaten from a food truck at some point in your life. Yes, Austin is an up-and-coming city in more ways than one. While Austin is known as the music capital of Texas, it’s also renowned for its culinary aspirations with trendy food trucks parked at busy street corners throughout the city. 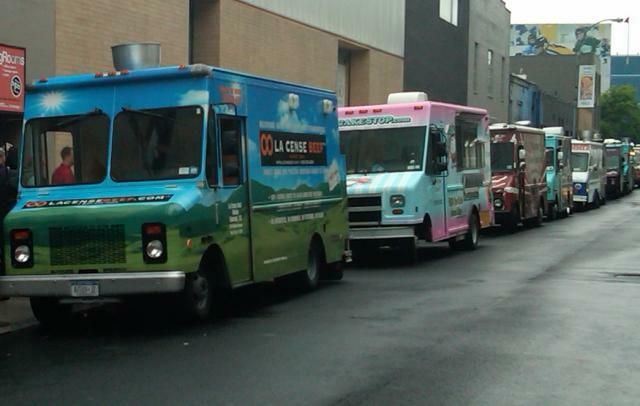 Food trucks, otherwise known as mobile kitchens or mobile canteens, have made their break in the restaurant industry within the past five years. In 2008, food trucks were legitimized in the Big Apple as the Rickshaw Dumpling Bar introduced gourmet food to the average street customer at a rock-bottom price. For most food trucks, the busiest day of the week is Monday. This is when workers begin their week and are looking to squeeze in a quick, affordable bite to eat between meetings or on their way to work. Interestingly enough, street food is eaten by roughly 2.5 billion people every day. Top cities for food truck fans include San Francisco, Los Angeles, New York, and now Austin with the list of popular food trucks growing longer by the day. When it comes to your next special occasion, like a bachelor party or night out on the town, make sure to ask your limo driver to stop by a food truck at the end of the night after the bars close. This is the perfect opportunity to feed a rambunctious group with delicious, innovative food that can be conveniently found on the roadside. Shorty’s Burger and Fries: This delicious food truck is located on the corner of 5th Street and Colorado. They serve up 100% Angus beef burgers with a West Coast inspiration, offering hungry diners a chance to create their own burger with a long list of extras, like bacon, jalapenos, and special sauce. Hey!..You Gonna Eat or What? This is a new food truck run by a husband-and-wife duo on South Congress, where all of the food is made onsite. One of the crowd-pleasing favorites includes a Shiner beer-battered Monte Cristo served with a side of homemade fig and cherry jam. Nomad Dosa: This Indian food truck can also be found on South Congress, providing a delicious alternative to greasy fast food with vegan, vegetarian, and gluten-free dishes galore. Here’s a hint: try an Indian dosa with chutney, similar to a crêpe.